Macroautophagy (hereafter refer to as autophagy) is an intracellular catabolic process by which portions of cytoplasmic components are delivered to autolysosomes for degradation . Apoptosis is a well-studied form of programmed cell death that displays typical morphological characteristics, such as chromatin condensation, nuclear fragmentation, and membrane blebbing [2, 3]. Both autophagy and apoptosis are highly orchestrated cascades that play a vital role in embryonic development and tissue homeostasis [4, 5]. Dysregulation of them have been associated with a number of pathologies, such as cancer, autoimmune diseases, and neurodegenerative diseases . It's known that autophagy extensively communicates with apoptosis during cell fate decision in a myriad of physiological and pathological conditions [7, 8]. In low-stress situations, cells initiate autophagy as a pro-survival mechanism to combat apoptotic cell death. However, as stress increases towards a point of no return where cells are doomed to die, cells block autophagy and begin initiating apoptotic cascades . Thus, a better knowledge of those interactions between autophagy and apoptosis is of great importance, in order to optimally manipulate these two crucial pathways for therapeutic purposes. 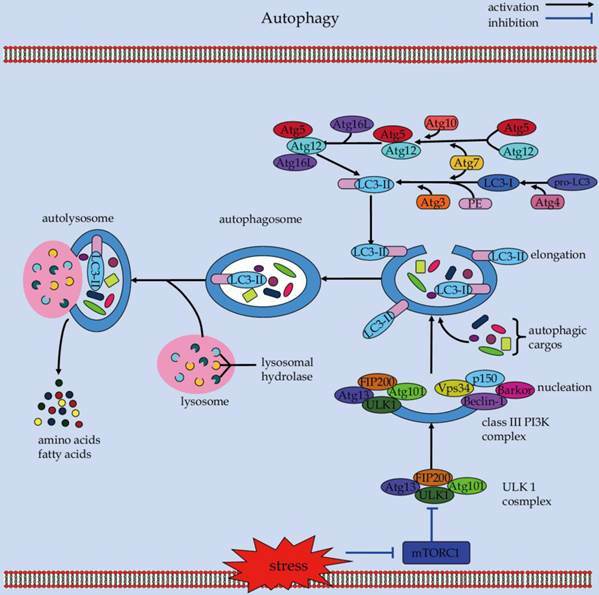 An overview of the cellular and molecular events during autophagy. Caspases, a family of cysteinyl aspartate-requiring proteases, play a central role in the transduction of apoptotic signals . Apoptotic caspases can be divided into two general categories: the initiator caspases consisting of caspase-2, -8, -9 and -10; and the effector caspases consisting of caspases-3, -6 and -7 [11, 12]. Caspases normally appear as inactive zymogenic precursors. They can be activated to mediate apoptosis in response to diverse pro-apoptotic stimuli from outside and inside of the cells . Emerging evidences demonstrate that caspases can also influence the non-apoptotic signaling events, in particular, the “self-eating” autophagy [14, 15]. Further research shows that caspases can inhibit autophagy by cleaving and destroying the pro-autophagic activity of autophagy-related (Atg) proteins, such as Atg3 and Beclin-1 [16, 17]. Whereas, caspase-9 can facilitate autophagosome formation by promoting the Atg7-dependent conversion process of microtubule-associated protein 1 light chain 3 (LC3) . On the other hand, the cytoprotective autophagy counter-balances apoptosis by continuous sequestration of active caspase-8 into autophagosomes for its subsequent degradation in Bax-/- Hct116 colon carcinoma cells . However, autophagosomal membrane also serves as a platform for intracellular death-inducing signaling complex (DISC)-mediated caspase-8 activation and apoptosis . Therefore, elucidating these unexpected functions of caspases in linking the autophagic and apoptotic signaling pathways helps decipher the molecular basis underlying autophagy-apoptosis crosstalk, which can drive therapeutic development by optimally manipulating these two important processes. In this review article, we focus on the biological effects and underlying mechanisms of caspases in directing the conversation between autophagy and apoptosis in the mammalian systems (unless otherwise stated). In particular, we emphasize that further insights into the role of caspases in mediating autophagy-apoptosis crosstalk will guide future therapeutic strategies during cell death control. Autophagy is a catabolic process which involves the turnover of cytosolic protein aggregates and damaged organelles in the lysosomes via double-membrane autophagosomes (Figure 1) . The autophagic process consists of initiation, elongation, maturation, fusion, and degradation . It begins with the nucleation and expansion of an isolated membrane called the phagophore, which can sequester portions of cytoplasmic materials to form an autophagosome . Subsequently, the autophagosome fuses with a lysosome to form an autolysosome, where the captured cargos are degraded by hydrolytic enzymes for recycling . The autophagy machinery is tightly controlled by a set of Atg proteins that can assemble into several different complexes to produce autophagosomes [25, 26]. Among these core multimolecular complexes, the ULK1 complex, made of ULK1, Atg13, Atg101, and FIP200 (focal adhesion kinase family-interacting protein of 200 kD), plays a critical role in the initiation of autophagy . Under nutrient-rich conditions, the serine/threonine kinase mammalian Target of rapamycin (mTOR) acts in concert with other proteins of the mTOR complex 1 (mTORC1) to suppress autophagy through direct interaction with the ULK1 complex . In contrast, in response to stress conditions such as starvation, mTOR is inhibited and dissociates from the ULK1 complex . This can result in the activation of ULK1 and ULK1-catalyzed phosphorylation of Atg13, FIP200, and ULK1 itself, which is essential for initiating autophagy . Also, AMP activated protein kinase (AMPK) can activate ULK1 via a direct phosphorylation mechanism . AMPK interacts with ULK1 and phosphorylates it on Ser 317 and Ser 777, which can lead to activation of ULK1 kinase and autophagy induction in response to glucose starvation . Downstream of the ULK1 complex, the class III phosphatidylinositol 3-kinase (PI3K) complex exerts an essential role in the nucleation and assembly of the initial phagophore membrane . Beclin-1 functions as a platform by binding several cofactors such as barkor (Beclin-1-associated autophagy-related key regulator), p150, and UVRAG (UV irradiation resistance-associated gene) to assemble the class III PI3K complex during autophagosome formation [32-36]. Of note, the phosphorylated ULK1 can promote the class III PI3K complex-mediated phagophore nucleation , possible through phosphorylation of key molecules such as AMBRA (activating molecule in Beclin-1-regulated autophagy protein 1) , and Beclin-1 . The subsequent elongation process requires the involvement of two ubiquitin-like conjugation reactions: the Atg5-Atg12 conjugation and LC3-PE (phosphatidylethanolamine) conjugation . Analogous to ubiquitination, Atg12 is conjugated to Atg5 to form Atg12-Atg5 conjugate, with the help of the E1-like enzyme Atg7 and the E2-like enzyme Atg10. Similarly, the conjugation of LC3 to PE is mediated by the E1-like enzyme Atg7 and the E2-like enzyme Atg3. The Atg12-Atg5 then conjugates with Atg16L (Atg16-like protein) to form an approximately 800-kDa protein complex containing Atg12-Atg5-Atg16L . This complex serves as a platform for stimulating the LC3-PE conjugation reaction [42, 43], which is essential for the elongation of the pre-autophagosomal membranes [44, 45]. Noteworthily, although molecules such as Beclin-1 interacting proteins (i.e., UVRAG and Rubicon) have been proven to be involved in the maturation of autophagosomes [46-48], the role of Atg proteins in the maturation and fusion step of autophagosomes, however, remains unclear and requires further characterization. Apoptosis is a self-destructive process with carefully choreographed steps (Figure 2) . During the apoptotic process, a series of intracellular events come into play to decommission the unwanted and dangerous cells [50, 51]. Apoptosis is crucial for embryonic development, organogenesis, as well as tissue homeostasis [3, 52]. Aberrant regulation of apoptosis can lead to either pathological cell accumulation or inappropriate cell loss, which eventually results in the pathogenesis of various human disorders, including cancer, infection, neurodegeneration, and autoimmune diseases [5, 50, 53]. Caspases, both the initiators and the effectors, play a major role in execution of apoptotic cascades . Mechanically, two major apoptotic signaling pathways, including the extrinsic and intrinsic signals, converge onto these caspases to initiate cell death [3, 55]. The extrinsic apoptotic cascade is triggered by ligation of cell-surface death receptors of the tumor necrosis factor (TNF) receptor superfamily, such as CD95/Fas or TNF-related apoptosis-inducing ligand (TRAIL) receptors [56, 57]. Upon ligand binding, the receptors become oligomerized forms, recruiting Fas-associated death domain (FADD) and procaspase-8 to form the death-inducing signaling complex (DISC) . Recruitment of procaspase-8 to the DISC facilitates its self-cleavage into active caspase-8 enzyme that later cleaves effector caspases . These effector caspases can further cleave a number of cytosolic and nuclear substrates to execute apoptotic cascades that leads to morphological and biochemical features of apoptosis . Alternatively, caspase-8 can propagate apoptotic death signals through proteolysis of the Bcl-2 homology-3 (BH3)-only protein Bid. The truncated Bid (tBid) translocates to the outer mitochondrial membrane to orchestrate a process that mediating mitochondrial outer membranes permeabilization (MOMP) [61, 62]. MOMP is a crucial event during apoptosis . As an outcome of this process, pores are formed in the outer mitochondrial membrane, membrane integrity is compromised, and apoptogenic proteins (i.e., cytochrome c) within the intermembrane space are released into the cytosol to induce apoptotic cell death. 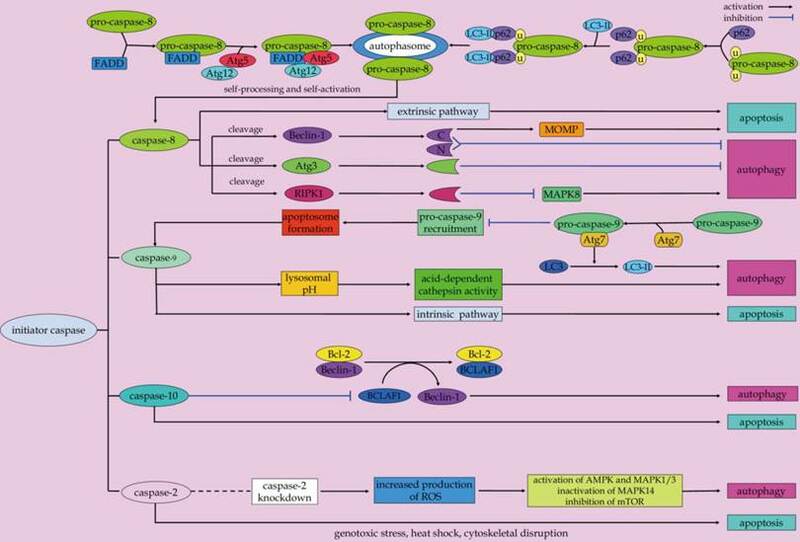 The intrinsic pathway of apoptosis is triggered by a wide range of intracellular death signals, such as DNA damage, cytotoxic stress, and growth factor withdrawal . In response to these apoptotic stimuli, the integrity of the outer mitochondrial membrane is lost, and the permeabilization of outer mitochondrial membranes is culminated . This will thereby permit release of many pro-apoptotic proteins that are normally confined to the intermembrane space, in particular, cytochrome c, into the cytoplasm to promote caspase activation [66, 67]. In the cytoplasm, the apoptogenic factor cytochrome c associates with apoptotic protease-activating factor 1 (Apaf-1) and initiator caspase-9 to form a multi-protein complex known as apoptosome [65, 68]. 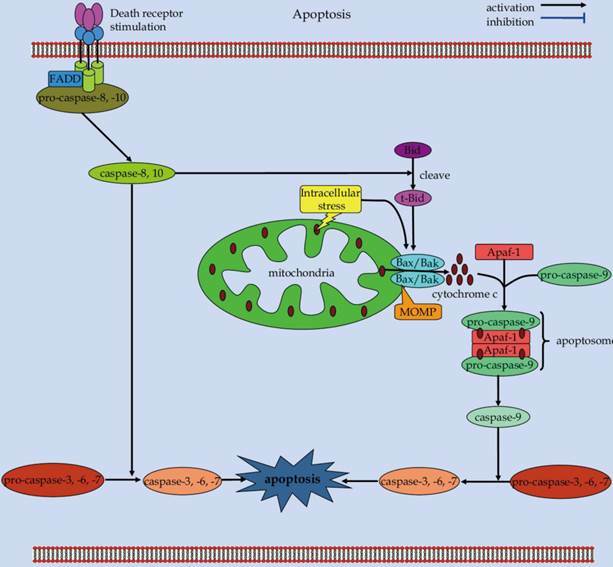 The apoptosome serves as a molecular platform for caspase-9 processing and activation, which can subsequently activate downstream executioner caspases to orchestrate apoptotic cell death . Scheme of the extrinsic and intrinsic apoptotic pathways. Autophagy and apoptosis have been proven to extensively cross talk with each other in cell fate decision [70-73]. With series of key findings, molecular mechanisms underlying the complex counter-regulation between autophagy and apoptosis are emerging. Of much interest, caspases, a family of cysteine proteases that are instrumental to the execution of apoptosis, serve as important players in directing these conversations between autophagy and apoptosis. Multiple pro-apoptotic signals, both inside and outside the cells, can converge to activate caspases to initiate apoptosis. In addition, activated caspases can degrade essential autophagy proteins (i.e., Beclin-1, Atg5, and Atg7) to shut down the autophagic response instead [74-76]. Moreover, after been cleaved by caspases, some pro-autophagic proteins can be even converted into pro-apoptotic ones to trigger apoptotic cell death. On the other hand, autophagy can influence apoptotic cascades by regulating the amount and activity of caspases. And autophagic elimination of caspases, such as caspase-8, can hamper their involvement in the apoptotic pathways . Caspase-8 is a well-known initiator caspase implicated in the death receptor-triggered apoptosis . As aforementioned above, in the context of extrinsic apoptosis, caspase-8 is activated by dimerization and autoproteolysis inside the DISC, and subsequently released into the cytoplasm to activate effector caspases for efficient apoptosis execution [57, 78-81]. Apart from its pro-apoptotic properties, caspase-8 plays an important role in the modulation of autophagy. Data from in vitro studies demonstrated that caspase-8 can rescue T cells from hyperactive autophagy [15, 82]. In response to energetic demands for rapid clonal expansion, the autophagic responses inside T cells are stimulated . The autophagic signaling can induce an interaction among Atg5-Atg12-Atg16L, FADD, caspase-8, and receptor interacting protein kinase 1 (RIPK1), which promotes the activation of caspase-8 in mitogenically stimulated live T cells . Activated caspase-8 can directly cleave the serine/threonine kinase RIPK1 as part of a negative feedback loop to limit autophagic signaling [82, 84]. In fact, RIPK1 also has emerged as a key upstream regulator which controls of apoptosis and necroptosis [85-87]. Besides, RIPK1 is required for MAPK8 activation and induction of protective autophagy to blunt apoptosis in TRAIL-treated cancer cells . Whereas, RIPK1 can be cleaved by the active caspase-8 during apoptotic cascades . These evidences indicate that the caspase-8/RIPK1 is involved in the crosstalk between autophagy, apoptosis and necroptosis, which is of interest for future investigation. Atg3 is a critical regulatory component for autophagosome biogenesis. It is conceived as a new substrate of caspase-8 during receptor-mediated cell death . 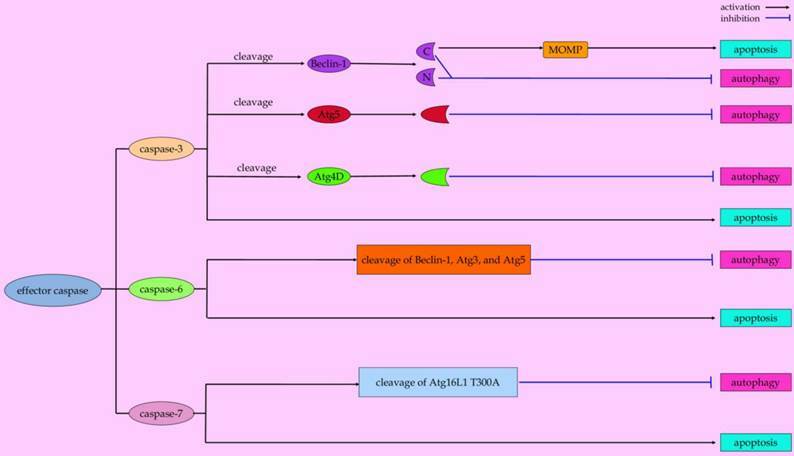 By targeting the evolutionary conserved LETD sequence (Atg3 amino acids 166-169) of this protein, caspase-8 mediates the cleavage of Atg3. As a result, the pro-autophagic activity of Atg3 is abolished after it has been cleaved, which is a critical event in autophagy inactivation during death receptor-triggered apoptosis . Scenarios for initiator caspases-mediated crosstalk between apoptosis and autophagy. On the other hand, autophagy contributes to the regulation of caspase-8-mediated apoptosis under the condition of proteasome inhibition [82, 89]. In response to proteasome inhibition, the autophagy flux can increase as a compensatory mechanism for protein degradation [90, 91]. Moreover, it has been shown that autophagosomes serve as a platform for intracellular DISC formation for caspase-8 self-processing, which is responsible for initiation of the caspase cascades and execution of apoptosis . The association of FADD with the Atg12-Atg5 complex facilitates caspase-8 recruitment to the autophagosomal membrane to form a proper higher-order oligomer structure for caspase-8 activation . Also, the adapter protein p62 can facilitate the recruitment of self-associated caspase-8 to autophagosomal membranes via its interaction with LC3-II . This event contributes to the formation of proper oligomer structures for caspase-8 self-processing and self-activation [20, 92, 93]. It is important to note that the functional domains of p62, including UBA (ubiquitin-associated) which binds ubiquitinated proteins, PB1 (Phox and Bem1p) that mediates dimerization/oligomerization, and LC3 interaction region, are required for p62 in mediating caspase-8 activation [94-97]. In particular, the UBA domain at the C-terminus of p62 is an important domain for binding and aggregation of polyubiquitinated caspase-8 for its final activation [98, 99]. As a consequence, the enhancement of caspase-8 self-aggregation and activation due to p62 upregulation in the setting of autophagy inhibition can sensitize human colon carcinoma cells to the BH3 mimetic agent ABT-263-induced apoptosis . Consequently, blockage of autophagolysosomal degradation pathway can result in an increase in the association of aggregated caspase-8 with p62 and LC3, which contributes to caspase-8 oligomerization, activation, and apoptotic signal transduction in the mammalian degenerin homolog G430F mutant-triggered cells . Conversely, the autophagic degradation of caspase-8 precursor or a subunit of the active caspase-8 enzyme can hinder caspase-8-induced apoptosis . In Bax-/- Hct116 colon carcinoma cells that are resistant to TRAIL-mediated apoptosis, TRAIL signaling mediates a protective autophagic response. This keeps the caspase-8-dependent apoptotic response at bay, probably through continuous elimination of the caspase-8 precursor and/or the active caspase-8 large subunit . And autophagy inhibition due to Beclin-1 RNA interference allows for a significant increase in caspase-8 enzymatic activity, resulting in downstream caspase processing and apoptosis activation . Summarizing it all together, caspase-8 functions as a switch point in polarization between autophagy and apoptosis during cell-fate determination. Caspase-9 is another essential initiator caspase that is involved in the intrinsic apoptosis pathway [100, 101]. Once activated, caspase-9 is able to process downstream effector caspases, including caspase-3, -6, and -7, all of which can target key structural and regulatory proteins to bring about apoptotic cell death . Intriguingly, Jeong and colleagues demonstrated the involvement of caspase-9 in promoting autophagy-mediated cell survival of breast cancer MCF-7 cells . Inhibition of caspase-9 can negatively regulate lysosomal pH and acid-dependent cathepsin activities that causes blockage of cytoprotective autophagy and augment of cell death following the exposure of the non-steroidal anti-inflammatory drug FR122047 . In addition, Han and coworkers described that caspase-9 acts as a novel co-regulator of autophagy and apoptosis through its mutually regulation with Atg7 . Caspase-9 can interact with Atg7 via the C-terminal region of the large subunit caspase-9, which facilitates the Atg7-dependent formation of autophagosomal LC3-II and autophagic function. The interaction of caspase-9 with Atg7 can potentially interfere with the recruitment and processing of caspase-9 in the apoptosome. The interference can ultimately inhibit caspase-9 activation and apoptotic signal transduction . Although the cross-regulation between Atg7 and caspase-9 is a possible mechanism that determines the participation of caspase-9 either in autophagy or apoptosis, additional molecular scenarios should be still considered. For instance, a phosphorylation mechanism may serve as a potential determinant in the involvement of caspase-9 in either apoptotic or autophagic cascades [18, 104, 105]. However, the exact molecular mechanisms that forces caspase-9 into either autophagic or apoptotic mode should be addressed. Caspase-2, one of the most conserved members of the caspase family, has been proven to be a crucial mediator of apoptotic cascades in a context-dependent manner. Examples include genotoxic stress , heat shock [107, 108], and cytoskeletal disruption . In addition to its role in apoptosis, evidence suggests that caspase-2 is involved in the negative regulation of autophagy . Loss of caspase-2 has been shown to lead to an enhanced autophagy in mouse embryonic fibroblast. Increased production of reactive oxygen species and oxidative stress in cells lacking caspase-2 contribute to upregulation of AMPK, activation of MAPK1/3, downregulation of mTOR induction, and inactivation of MAPK14, which play a role autophagy induction . Additionally, when the neurons cultured from young adult mice cannot undergo apoptosis due to lack of caspase-2, the pro-survival autophagy can be induced at an early stage in response to rotenone-mediated mitochondrial oxidative stress . These evidences suggested that caspase-2 can be a molecular link between autophagy and apoptosis. Caspase-10, the closest homolog of caspase-8, functions as an initiator caspase of extrinsic apoptotic signaling pathway [112, 113]. Of interest, Lamy et al. discovered that caspase-10 also plays an important role in maintaining the proper autophagic activities in myeloma cells . Caspase-10 can cleave and inactivate Bcl-2-associated transcription factor 1 (BCLAF1), a potent autophagy inducer that can induce autophagy by displacing Beclin-1 from Bcl-2 complex, thus preventing myeloma cells from uncontrolled autophagy . The enhanced association between the caspase-like protein cFLIPL and caspase-10 in myeloma cells promotes caspase-10-mediated BCLAF1 cleavage, thus limits BCLAF1-induced autophagic cell death of myeloma cells . Caspase-3 is a predominant player in the execution of apoptotic cell death. However, recent studies indicated that capase-3 plays a role in autophagic processes . In human apoptotic endothelial cells under conditions of nutrient shortage, activated caspase-3 favors the extracellular export of autophagic vacuoles via rerouting autophagic vacuoles toward the cell membrane . The externalization of large autophagic vacuoles may contribute to apoptotic decrease in volume, a geometric determinant for cell dismantling into apoptotic bodies . These evidences represent caspase-3 as a potential molecular switch in mediating crosstalk between the autophagic and apoptotic programs . Zhu and coworkers reported that caspase-3 can cleave autophagy-associated protein Beclin-1 at positions 124 and 149 during staurosporine-induced apoptosis, thus abrogating the pro-autophagic effect of Beclin-1 in HeLa cells . Moreover, the cleavage of Beclin-1 disrupts its interaction with Bcl-2, which leads to the exposure of the BH3 domain of Beclin-1 to other anti-apoptotic Bcl-2 family members [119-121]. The competitive binding of truncated Beclin-1 with anti-apoptotic Bcl-2 family members allows pro-apoptotic BH3-only molecules released from the Bcl-2/Bcl-xL complex to initiate intrinsic apoptotic cascades [121, 122]. Also, Atg4D, one member of the Atg4 family in mammalian cells that contributes to starvation-induced autophagy, can be cleaved by caspase-3 at the DEVD63K motif . More importantly, cleavage of Atg4D by caspase-3 enables it to stimulate the priming and delipidation of the LC3 paralogue, GABARAP-L1 (γ-aminobutyric acid receptor-associated protein (GABARAP)-like 1), indicating that caspase-3 promotes Atg4D-coordinated autophagy . It is noteworthy that caspase-cleaved ΔN63 Atg4D can induce cell death when overexpressed in human cells . The cleaved Atg4D-mediated cell toxicity is associated with its recruitment to mitochondria to induction of apoptosis . Unfortunately, whether Atg4D can cause the release of proapoptotic mitochondrial factors by targeting Bax or Bak is still unknown. Other effector caspases, including caspase-6 and caspase-7, not only play a role in the execution phase of apoptosis [124, 125], but also affect the autophagic pathway. When melanoma cell lines undergo arginine deprivation, TRAIL-initiated caspase-6 activation contributes to disruption of pro-survival autophagy by cleavage of two key autophagic proteins (Beclin-1 and Atg5) . And evidence from an in vitro study demonstrated that proteins such as Atg3 and p62 can be cleaved by caspase-6, suggesting its potential role in the regulation of autophagy . By using knock-in mice, the effects of the Atg16L1 T300A (a common threonine to alanine coding variant at position 300 in Atg16L) polymorphism on the autophagy pathway were studied by Lassen et al. They found that Atg16L is a substrate for caspase-7, while the Atg16L1 T300A is more susceptible to caspase-7-mediated cleavage compared with the wild-type protein, which is associated with the reduced antibacterial autophagy in cells of Atg16L T300A mice . Nevertheless, other mechanisms underlying these two caspases in linking autophagy and apoptosis are warranted to be further elucidated. Paradigms of effector caspases-mediated conversation between autophagy and apoptosis. Calpains represent a well-conserved family of calcium-sensitive cysteine proteases localized to the cytosol and mitochondria . They exert important roles in a number of fundamental physiological processes, including the execution of apoptosis [128-130]. Evidence demonstrates calpains are involved in the apoptotic process at numerous steps. For instance, calpain is capable of processing and activation of several caspases, such as caspase-7 and caspase-12, which can sensitize cells to Ca2+-dependent apoptosis [131-133]. Calpain is also able to cleave pro-apoptotic Bcl-2 family proteins including Bid and Bax, which in turn mediates cytochrome c release and initiates the apoptotic execution [134-136]. Not surprisingly, similar to the caspase family proteases, the calpain plays a role in linking autophagy to apoptosis . In sphingosine-1-phosphate phosphohydrolase 1 (SPP1)-depleted cells, doxorubicin switches protective autophagy to apoptosis via calpain-mediated Atg5 cleavage . The truncated Atg5 cleaved by calpain translocates from the cytosol to mitochondria and associates with the anti-apoptotic Bcl-xL to trigger cytochrome c release and caspase activation, and triggers apoptotic cell death . Taken together, these experimental data suggest the potential importance of calpain in the crosstalk between autophagy and apoptosis and the need for further investigation of the cellular functions of these cysteine proteases in the switch between autophagy and apoptosis. The role of caspase in the cross-regulation between apoptosis and autophagy has also been surveyed in other model systems, in particular, the Drosophila system. As an effector caspase, death caspase-1 (Dcp-1) plays a role in maintaining the balance between autophagy and apoptosis during Drosophila melanogaster oogenesis [140-142]. DeVorkin et al., found that Dcp-1 is a positive regulator of starvation-induced autophagic flux during Drosophila midoogenesis . Dcp-1 promotes autophagy by negatively regulating the levels of mitochondrial adenine nucleotide translocase stress-sensitive B and adenosine triphosphate, suggesting a novel mechanism of caspase-mediated regulation of autophagy . By performing a large-scale in vivo genetic screen, Kim and coworkers found that full-length Dcp-1 can induce autophagy, whereas the truncated active Dcp-1 can result in apoptosis instead . It is also hypothesized that the levels of Dcp-1 activity determine the sensitivity thresholds of autophagic and apoptotic responses . Low levels of Dcp-1 activity due to starvation initially induce a pro-survival autophagy for Drosophila melanogaster cells . Whereas, higher levels of Dcp-1 activity in response to prolonged starvation signals will result in the cleavage and activation of another effector caspase, drICE , which triggers apoptotic death of these cells. Nevertheless, the molecular details of Dcp-1 in governing the autophagy-apoptosis switch are warranted to be elucidated . Autophagy and apoptosis are two evolutionarily conserved processes that play a crucial role in determining cell fate. Despite of the marked differences between these two catabolic processes, autophagy and apoptosis are intimately connected with each other. In the majority of cases, autophagy and apoptosis tend to be mutually inhibitory. Caspases have a cardinal role in apoptotic cell death and plays a critical role in directing autophagy-apoptosis crosstalk (Table 1). Processed caspases can shut off the autophagic response by degradation of Atg proteins (i.e., Beclin-1, Atg5, and Atg7). In some special cases, the pro-autophagic proteins can be even converted into pro-apoptotic ones to mediate apoptotic cell death after having been cleaved by caspases. On the other hand, autophagy can influence the apoptotic cascades by regulating the amount and activity of caspases. Undoubtedly, these key findings have renewed our knowledge of the unique roles of caspases in directing autophagy-apoptosis conversation. However, molecular mechanisms underlying caspase-mediated autophagy-apoptosis crosstalk are still incomplete and fragmented. Current evidence emphasized that direct protein-protein interactions between caspases and autophagy-associated proteins enable the multiple layers of communications between autophagy and apoptosis during cell fate decision [9, 147]. For instance, most cases merely illustrate a functional outcome for the given interacting proteins (i.e., cleavage of Beclin-1 by caspase-3 abolishs its pro-autophagic function) in the in vitro settings. However, these binary protein interactions of specific caspases and Atg proteins exhibit clear directionality that does suggest the effects of these given caspases on autophagic and apoptotic processes in an in vitro assay under specific conditions. It remains a pending conundrum whether such binary interactions actually reflect the nature of the crosstalk between autophagy and apoptosis in an in vivo circumstance. Thus, further research is necessary to evaluate that the functions of the protein-protein interactions between caspases and Atg proteins in the autophagy-apoptosis crosstalk in animal models and human clinical models. This will provide a more global and integrative understanding of how they converge together to determine autophagic and apoptotic response in the physiological and pathological settings. In addition, there is a substantial body of literatures implying that caspases-mediated cleavage of Atg proteins underlies the apoptotic pathway to block the autophagic flux. In contrast, less is known at the mechanistic level about how Atg-dependent autophagic mechanism controls apoptosis by regulating the amount and activity of caspase. Therefore, it is interesting to assess whether autophagy is capable of modulating the apoptotic process by selectively degrading other caspases beyond caspase-8. Moreover, the interrelationship between autophagy and apoptosis are highly context-dependent and cell-specific , which places the caspase network in a more complicated situation in driving the switch between autophagy and apoptosis. Thus, effective techniques such as proteomics studies and transgenic technology (i.e., transgenic mice) are required to further reveal the potential substrates of caspases in the autophagic process. More potent and specific “druggable” inhibitors are anticipated for the experimental or therapeutic inhibition of autophagy. More reliable and meaningful assays for measuring autophagic flux are needed as well. Together, these chemical and proteomics technologies help manipulate and analyze the caspase interactome to probe the mutual relationships between autophagic and apoptostic processes. Summary of current evidences concerning the molecular basis of caspase-mediated autophagy-apoptosis crosstalk. AMBRA: activating molecule in Beclin1-regulated autophagy protein 1; AMPK: AMP activated protein kinase; Apaf-1: apoptotic protease-activating factor 1; Atg: autophagy-related; Atg16L: Atg16-like protein; Atg16L1 T300A: a common threonine to alanine coding variant at position 300 in Atg16L; barkor: Beclin-1-associated autophagy-related key regulator; BCLAF1: Bcl-2-associated transcription factor 1; BH3, BCL-2 homology-3; Dcp-1: death caspase-1; DISC: death-inducing signaling complex; FADD: Fas-associated death domain; FIP200: focal adhesion kinase family-interacting protein of 200 kD; GABARAP: γ-aminobutyric acid receptor-associated protein; LC3: the protein microtubule-associated protein 1 light chain 3; MOMP: mitochondrial outer membranes permeabilization; mTOR: mammalian Target of rapamycin; PE: phosphatidylethanolamine; PI3K: phosphatidylinositol 3-kinase; RIPK1: receptor interacting protein kinase 1; SPP1: sphingosine-1-phosphate phosphohydrolase 1; TNF: tumor necrosis factor; TRAIL: TNF-related apoptosis-inducing ligand; UBA: ubiquitin-associated; UVRAG: UV irradiation resistance-associated gene. This study was supported by National Natural Science Foundation of China (grant. 81171096, 81371433, 81271273, and 81371369), Research Fund for the Doctoral Program of Higher Education of China (20120101120030), Zhejiang Provincial Medical Science and Technology Planning Project (grant. 2012RCA030 and 2013KYA088), Zhejiang Provincial Education Planning Project (Y201226287) and Zhejiang Provincial Natural Science Foundation of China (grant Y13H090007 and LY13H090002). Corresponding author: Dr. Yuan Hong Or Dr. Jianmin Zhang, Department of Neurosurgery, Second Affiliated Hospital, School of Medicine, Zhejiang University, Hangzhou, Zhejiang 310009, China; Tel: +86-571-87784785; Fax: +86-571-87784755; E-mail: hy0904cn.